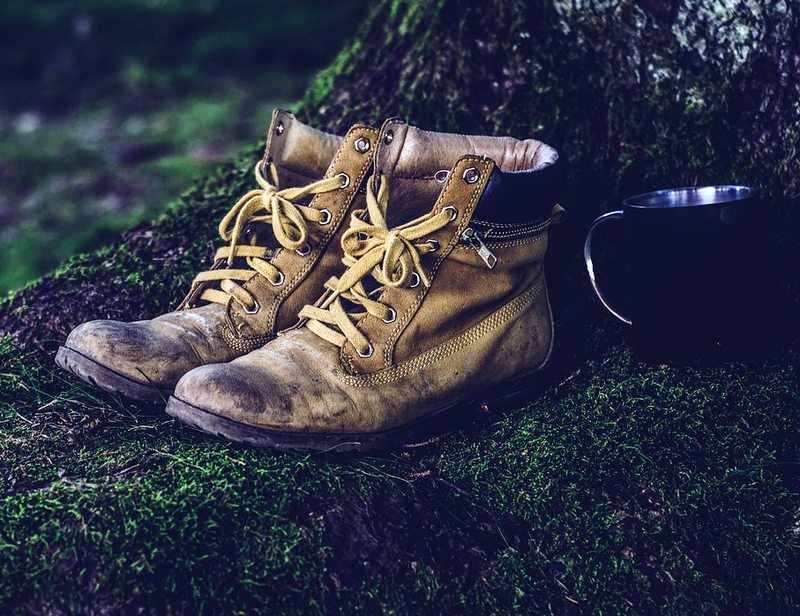 Hiker Trash – a term of endearment used to describe the necessary mental shift caused by living in the woods on a thru-hike for long periods of time. Symptoms include a modification of socially acceptable behavior, especially in regards to frequency of showering and laundering; what constitutes nutrition; where and how you sleep; and what is meant by the word comfort. It does not refer to those who disrespect the trail, nature, or others. No, those people are just plain trash. The feeling I get when such a sentence is muttered is akin to the feeling of fear mixed with anticipation one gets when something delectably awful is about to happen. Like when a group of men are gathered around a bonfire drinking beers and one says, “Hold my drink, I wanna try something.” Yeah, it’s like that. Jen and I had been living in Costa Rica for over three and a half years and this would be our first border run in over a year. Unless one becomes a resident or a citizen of the country, visitors to Costa Rica are governed by a 90-day tourist-visa. Our reasons for having to leave the country are complicated. We had paperwork showing we had applied for residency, but because we were planning to leave the country for good, we wanted to have a valid stamp just in case we had to deal with Migración. If we had to visit an agent in person we wanted our passport stamp up to date—because even though we were legally in the country, government officials like their i’s dotted, t’s crossed, and by-god, their passports stamped. The two easiest ways to get a tourist visa refreshed is to go to a bordering country; Panama or Nicaragua. Not only is this the easiest way, it is the cheapest and quickest. But, Jen was concerned. What if we were detained because our passports were out of date? What if we were kicked out of the country? While not the easiest, or cheapest, or fastest; the safest way to insure a new passport stamp was to fly to the States. It is well known that an out of date stamp is rarely a problem at the airport. We needed to fly out, and unnervingly Jen said she had an idea of how best (read: most frugal way) to do it. She went on to explain there is even a website named Sleeping in Airports that ranks airports based on their livability. Fort Lauderdale, where we needed to go, ranked OK in sleepability. We lived in Costa Rica on a very strict budget, because we had decided in our early 40’s to leave successful careers for a semi-retired life where we valued experiences and adventure over possessions. 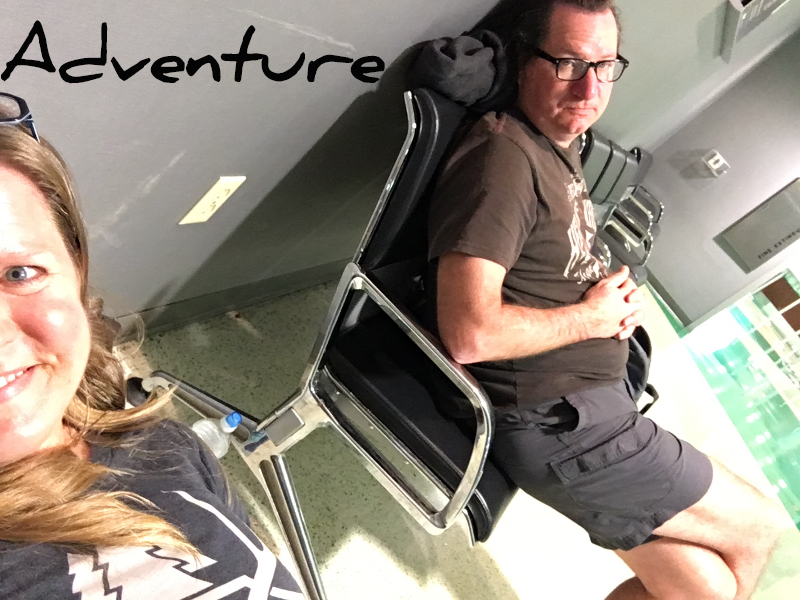 Adventure was one word for sleeping in an airport. Tickets were bought on Spirit (with no upgrades, naturally) and we would carry our own snacks. We would arrive in Florida around 3 p.m. and leave out the next morning at 8 a.m. Only 17 hours in an airport, how hard could it be? We arrived in Florida right on time. Having no luggage except our carry-ons there was nothing to do but let the waiting begin. We went to a pub and each got a drink and discussed our plan. After wasting a couple of hours with drinks and roaming the different shops in the terminal we arrived in, we set out to find our hotel … er, the car rental terminal. We took a free airport shuttle several miles away, exited the shuttle and entered a modern, large building. And yes, it was air-conditioned. And yes, there sat a faux leather couch near the Avis counter. While the couch was present, there also were bright overhead lights spotlighting the sofa. No darkened corner here. We decided we would start our experiment on a row of black chairs tucked away against a back wall. We were apprehensive about sleeping at the airport. What would other travelers think? Would a security guard ask us to leave? Should I sleep with my arms clutching my backpack? But we were here for the duration and had to buckle up for whatever came our way. We retrieved our laptops from our backpacks, plugged them in, and verified there was working wifi. It was eight o’clock, and we kept eyeing the couch covetously, as if someone would take our bed for the night. The terminal was still too busy for us to make our move. This was not true of the person I shall call Sleeping Boss. Sleeping Boss arrived just before 9 with what looked like a trunk on her back and dragging a huge duffle bag. Boss sat on our couch and began removing clothes and items from her various pieces of luggage. Finally, after about 30 minutes of fidgeting she packed up her things and left. We wondered what the heck she was doing, then noticed the boots she had left just in front of the middle section of the couch. Sure enough, Sleeping Boss came back looking fresh from a shower—where she took a shower is anyone’s guess—in a nightgown, still shouldering her box and dragging her duffle. Boss lined her luggage up, pulled out a fluffy blanket then laid on the couch, utilizing every square inch. She donned a black sleeping mask and put, what I assumed was, earplugs in her ears. 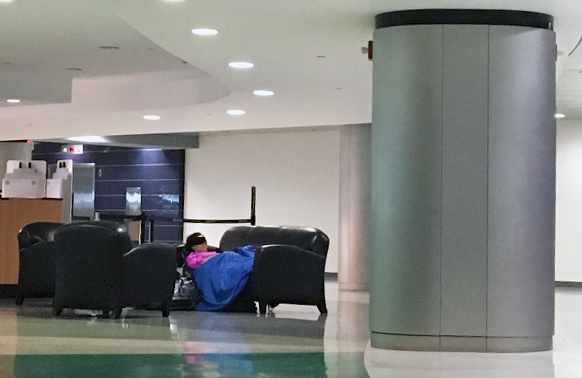 We watched this pro for several more minutes and realized we had a lot to learn about sleeping in airports. See, I am not exaggerating. We came to terms that our lack of temerity had cost us a comfortable couch and relegated us to the wire-framed, stiff, uncomfortable chairs. The night crept by in fits of sleep. At midnight the car kiosks closed but it took until 1 a.m. to complete the wrap up of their day. At 3 a low murmur startled me bolt upright. I immediately checked that Jen was OK, then looked to see that our backpacks were untouched. The sound was coming from near the sleeping couch and the murmur had turned to stifled giggles. A couple was looking at Sleeping Boss in awe … and taking creative selfies with the Boss in the background. I was able to get back to sleep shortly after “pictures with a celebrity” had completed. Then at 4 the cleaning staff began waxing the floor, going back and forth like someone mowing a lawn. We were up with the sound and movement, so gathered our gear and shuttled back to our exit terminal. The passport agent looked at our ticket and flight time and mentioned, “You guys sure are here early.” Yes. Yes we are. By 5 a.m. restaurants were open and we ate a slow breakfast and chatted about our experience and the naps we would take when we were back home. 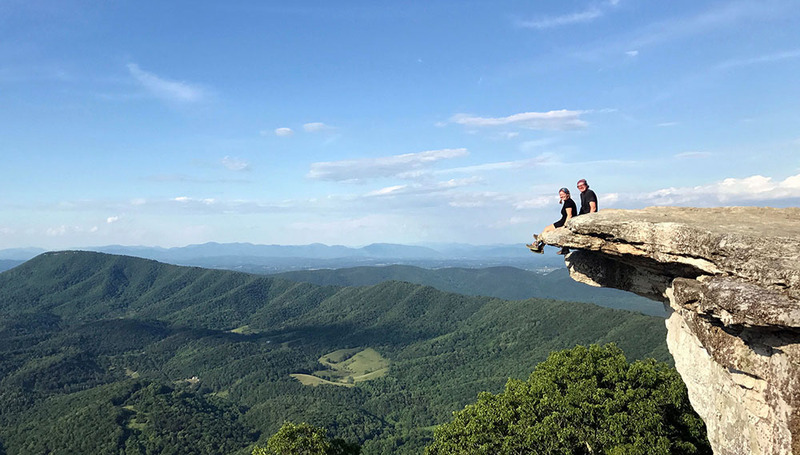 Each adventure Jen and I undertake—whether it is quitting our jobs, moving to Costa Rica, sleeping in an airport, or now, preparing to hike the AT—changes and strengthens us, making us better individually and as a couple. I look forward to the start of our Appalachian adventure in March. I look forward to evolving through the thru-hike. I look forward to becoming hiker trash. Thanks Mike. Five years ago, I never would have guessed we would be leading such a life. While it is not perfect it sure beats having a comfortable life but working ourselves into an early grave. We are having great adventures, shifting our worldview, having adventures, and becoming closer to each other. I think it is a great trade off. What a fun article! I could picture it all, including Jen’s face when she said “I’ve got an idea.” I must admit, I don’t share your specific sense of adventure, but I am going to enjoy reading about it! Thanks Gloria. You guys are quite adventures yourselves. It’s all about living an interesting life … I think we are both winning that game. You are a fine storyteller! Thank you so much for this, and the ones to follow! Aww, thanks Linda. We appreciate your support and can’t wait to share our journey with everyone. I think this is *definitive* proof of your adventurous spirits! And I loved the whole story (starting with the tell-tale, “I have an idea…”), especially your description of Sleeping Boss. I can see why you decided to make the trip to Florida instead of risking something going wrong at either the Nicaragua or Panama borders. Our residency had expired when we left and it was an ongoing underlying concern that somehow that was going to cause us troubles on our final travels. I know you felt better having that current stamp in your passport! Yep, everything probably would have been fine, but we aren’t that adventurous 🙂 Having the stamp did make the last 2 months more comfortable. I am so looking forward to following you and Jen on this next adventure. To say you guys ROCK wouldn’t be enough. Thank you for sharing all this with us, and bring on the AT!!!! Thanks for following along! It is going to certainly help having friends cheer us onward. I think it would have been a much easier trip if we weren’t so self-conscious about it. But it was a “fun” trip … just like the AT will be fun, where fun isn’t the right word, but close. Miss you, Guido, and the Cajon crew too. Oh, and can’t forget about the cats, dogs, and horse. I am so excited for your upcoming adventure and also love your stories of your current adventures!!!!!….. you guys are quite the marvericks!!!!! So glad you are enjoying following along. Sure wish we could have found our way down to Sierpe before we left. Oh well, maybe sometime in the future.